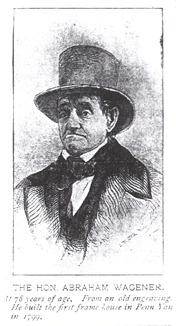 Abraham Wagener is generally conceded by local historians to have been the "father" of Penn Yan. He was the son of David and Rebecca Supplee Wagener, who married at Philadelphia in 1774. At that time the couple were in their early 20s. David was the son of Melchior and Gertrude Steyer Wagener and came from several generations of prosperous Pennsylvania German farmers. Of the elder couple's five children, the four who lived to adulthood all came to what is now Yates County, but only David and his elder sister Susannah had descendents. Their brother Jacob and sister Anna never married, and both followed the teachings of the Universal Friend to the time of their deaths. David Wagener came to the wilderness of western New York in 1791 when he was nearly 40 years old. There is evidence he tried to convince the Universal Friend to yield to him the Society's original millsite on the Keuka Lake Outlet, but he eventually became half-owner by purchase. Within a few years, in 1796, he bought another millsite farther upstream with a sawmill already in operation. He built a gristmill on the same dam, which was the first within the present limits of Penn Yan, but died in August 1799, still with young children at home. He and Rebecca were the parents of 10 children: Abraham, born 1774; Mary Magdalene, 1776; Anna, 1777; Melchior, 1779; Elizabeth, 1780; David, 1783; Rebecca, 1785; Lament, 1787; Rachel, 1789; and Rebecca, 1794. Of these, Elizabeth, David and the first Rebecca died as children; all the others married and had children of their own. Abraham was born, as were most of his siblings, in Montgomery County PA a few miles north of Philadelphia. He followed his father to New York in 1792, but lived apart from his parents and settled in the eastern part of what is now the town of Milo, near the hamlet of Himrod. In 1796 he returned to PA to marry Mary Castner. They had seven children before her death in 1811, three of whom lived to marry. Abraham Wagener remarried almost immediately, to Joanna Norris, the widow of Francis Edmondson. She bore him an additional six children, four of whom survived childhood. When David Wagener died in 1799, his elder son was already married with a young son of his own. Abraham's share of his father's estate was the larger part of what is now downtown Penn Yan, and he made immediate preparation to move there. He had a house built, said to have been the first frame dwelling in the village, and moved into it on New Year's Day, 1800, two days after the birth of his second son. Abraham's inheritance included the old sawmill on the Outlet's north bank; his younger brother Melchior received property on the south bank, including his father's gristmill. Abraham's first act was to build a gristmill of his own, immediately opposite his brother's, on the site now occupied by the Birkett Mill at the foot of Main Street. Melchior was charged by his father's will to care for their mother and run the home farm. Rebecca resided in a house on the north bank until her death in 1813. By that time Melchior had sold his property to Jeremiah Jillett and moved away, to a site in the town of Pulteney in Steuben County. David Wagener had run a road through the woods from his mill to the settlement at Benton Center about three miles away, and Abraham enlarged upon this and helped cut the new road between Canandaigua and Elmira. This was a mail route, and a post office was established at Wagener's house. It was called Jerusalem; he held the post for 14 years, by which time it had been renamed Penn Yan. He was appointed Justice of the Peace in 1808, and held that post for 26 years. Abraham Wagener donated the two-acre site which secured the county seat for his village in 1823; it was notoriously swampy, as was the whole site of the village. When the Crooked Lake Canal was opened for navigation in 1833 it ensured Penn Yan's future prosperity; the village was incorporated the same year and Wagener elected its first president, an office corresponding to that of mayor. Interestingly, at about the same time he was engaged in purchasing a large tract of land at the tip of Bluff Point, in the crotch between the Keuka Lake's two branches. He built a fabulous mansion there in 1833 and moved into it, miles from any other habitation, and stayed there until 1840, when he came back to Penn Yan. Legend has it that his second wife was a kleptomaniac, and his intent was to move her away from temptation. In any case, he lived apart from her after they came back, and died in 1853 in a handsome stone house that still stands (as does his mansion on the Bluff). He gave an interview a few years before his death to one of the local newspapers. The article remarks that, "he is about five feet nine inches in height, still unbowed by time, with a clear eye and exhibiting few marks of old age either in his appearance or actions. Perhaps something if not all of this exemption from the infirmities of advanced years may be traced to his habits: for he says of himself that he never went to a dance or frolic, never was drunk in his life and never laid abed in the morning ...." His energy clearly drove the village he chose for his home to thrive; but his inability to get along with any member of his family and his singularly sour countenance underscore the truth of his assertion that never in his life did he relax enough to have any fun.